2. Students are counted in the UK’s net migration statistics, as they are in our main competitor countries - the USA, Australia, Canada and New Zealand. These competitors also report students in separate administrative visa statistics, as does the UK. 4. 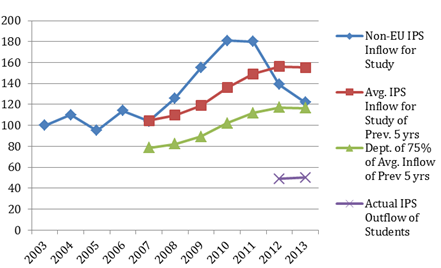 Since 2010 applications for Tier 4 visas for study at University have increased by 17%. At the same time applications for visas for further education (FE) and colleges have fallen by two thirds from 65,000 to 21,000. This is to be expected. Since 2010 the government has closed down 750 bogus colleges and it was in this sector (as well as the English Language school sector) that the National Audit Office found that much of the abuse of the Points Based System (PBS) had occurred. Figure 2. 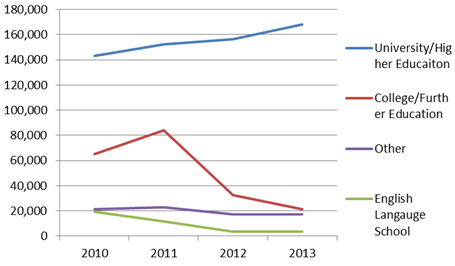 Applicants for Tier 4 visa by education sector, 2010-2013, Home Office. 5. The fall in Indian students to the UK is often used to suggest that immigration reform has harmed the education sector. In the year ending June 2014 just over 12,000 student visas were granted to Indian students. This compares to 58,000 in 2009, the year that the PBS was introduced. In 2010 the National Audit Office estimated that in this first year of the PBS alone as many as 50,000 bogus students entered the UK to work rather than study and identified India as a major source of bogus students. Indeed visa sections in India had to be closed to student visa applications because of the surge in bogus applications. Student applications were also suspended in China, Bangladesh and Nepal for the same reason and the suspension was not fully lifted until August 2010. 6. While Indian visas have fallen, visas to some nationals have increased. In the latest year there were 61,000 student visas issued to Chinese students, up from 44,000 in 2010 and Malaysian students have increased by 43% since 2010, as indicated in figure three. Figure 3. 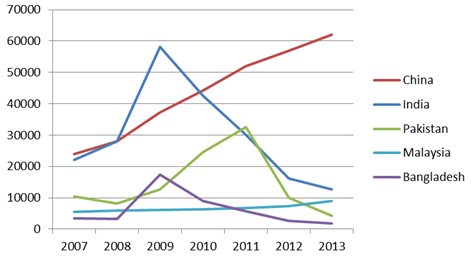 Grants of PBS Tier 4 Visa (and pre-PBS equivalent) by selected nationalities, 2007-2013, Home Office. 7. There have been calls for the post study work visa to be reinstated. There is no need for this as an unlimited number of graduates can currently switch into Tier 2 if they can find any graduate level work that pays £20,000 a year within four months of finishing their studies. This is more generous than the USA and New Zealand where post study work is strictly limited to the field of study. Permission to take low skilled work would only encourage overstaying. 8. It is often claimed that the government’s reforms of the student immigration system have received negative coverage in the foreign media which has created a view that foreign students are not welcome in the UK. In fact, any negative publicity has largely been created by the University lobby themselves. This, is completely contrary to their interests and, indeed, to the facts.